If you are wondering where the big thread ‘Meet the new Kepler’ on Semi’s paper has gone it’s here. You can always get to it or any other post by going to the ‘Archives’ on the right of the page. Detailed discussion of planetary motion is now continuing here. It’s difficult to get a handle on the ways forces acting on and in the solar system are orientated. This thread will raise more questions than answers about the origin and magnitude of the forces, but it might help with the orientation issues. The solar system is apparently orbiting the Milky Way galaxy at around 224km/s. On the larger scale, as well as the movement shown in this graphic, Dr Leif Svalgaard informs me that according to his way of measuring velocity and distance, there is a motion of 627km/s of the galaxy “towards the centre of the local group”. Additionally, there is the motion of the of the Local Interstellar Cloud, which is depicted here as moving in the direction of the south celestial pole. Dayton Miller in the 1920’s, confirmed by Yu. 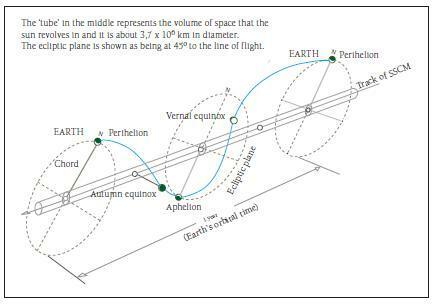 Galaev in 2002, concluded that the Earth was drifting at a speed of 208 km/sec. towards an apex in the Southern Celestial Hemisphere, towards Dorado, the swordfish, right ascension 4 hrs 54 min., declination of -70° 33′, in the middle of the Great Magellanic Cloud and 7° from the southern pole of the ecliptic. It seems possible therefore, that the solar system is headed in a similar direction to the LIC, in addition to it’s orbital motion wrt the galaxy. However, it is also thought that the solar system will soon be leaving the LIC and heading into a colder cloud. Perhaps someone here can clarify which direction we are heading out of the Local Cloud in. The planets orbit the sun at approximately 45 degrees wrt the direction of the solar system’s galactic orbital motion, as evidenced by the angle the band of the milky way makes in the night sky, remembering the Earth is inclined a further 23.5 degrees to the invariant plane (the average of the planetary orbital planes). It is thought that this tilt is necessary in order to maintain the conservation of angular momentum as the solar system moves in it’s orbital path round the galaxy. Vukevic has prepared this graphic which represents the orientation of the newly discovered ‘ribbon’ on the outer edge of the heliosphere, compared to the heliospheric current sheet (HCS) as depicted by Caltec, and has some ideas about it’s cause he’d like to discuss in a reasonable environment. What is the solar – planetary theory? A lot of people might visit here, see some fairly technical conversation going on, and wonder, “What’s it all about?” So I thought I’d devote a thread to explaining what we mean when we refer to ‘solar – planetary theory’. This thread is a first attempt at clearly summarizing it, and I hope a stimulating discussion will follow so that we can refine the hastily written outline presented here. In a nutshell, it is the hypothesis that the solar system is a system in the fullest sense of the word. That is: As well as the sun having a big effect on the planets (warming them with it’s radiation, keeping them in their orbits with it’s gravity, warding off a lot of the galactic cosmic rays from entering with it’s solar wind etc), the planets also have an effect on each other, and on the sun, causing it’s complicated motion around the centre of mass of the solar system, modulating solar magnetic activity and the production of sunspots. Issac Newton in his famous book ‘Principia Mathematica’ described the motion of the sun around the centre of mass, but held the opinion that ‘the sun feels no forces’ because according to his theory of Gravitation, the sun would be ‘in free-fall’. So why do proponents of solar-planetary theory think the planets can affect the sun? Firstly, Newton, although he quantified the gravitational force, didn’t try to explain what gravity was, or how it has it’s affect on matter. “I frame no hypotheses” he famously said. He lived in an age when ‘Natural Philosophy’ was trying to escape ideas which involved ‘action at a distance’. But gravity seemed to be an ‘action at a distance’ force par exellence. Secondly, Newtons laws of motion deal with idealized objects which are homogenous, rigid, and free of frictional and other forces. We don’t know much about the interior of the sun, but we do know it’s surface layers are much less dense than it’s deeper layers, and that the density gradient from surface to core may not be linear. We also know the surface layers are highly mobile and fluid, and are highly magnetized. This means the sun might get jiggled around internally as it moves in it’s complicated dance around the solar system barycenter. 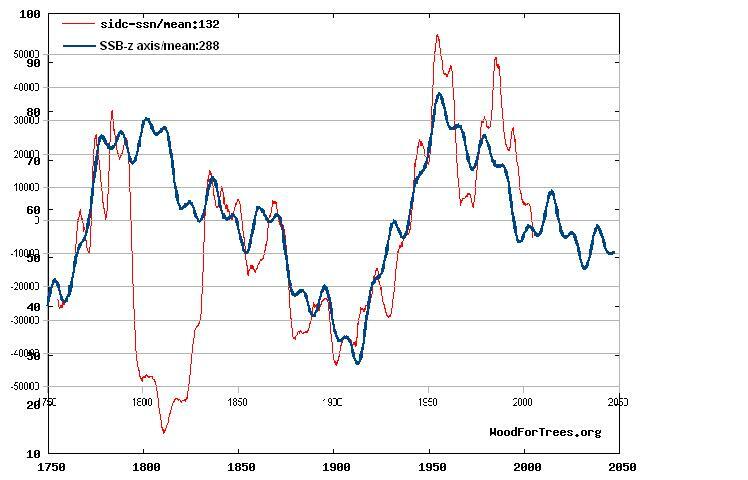 Thirdly, there appear to be correlations between changes in solar activity (particularly sunspot number) and the inter-related motions of the planets over the course of time. 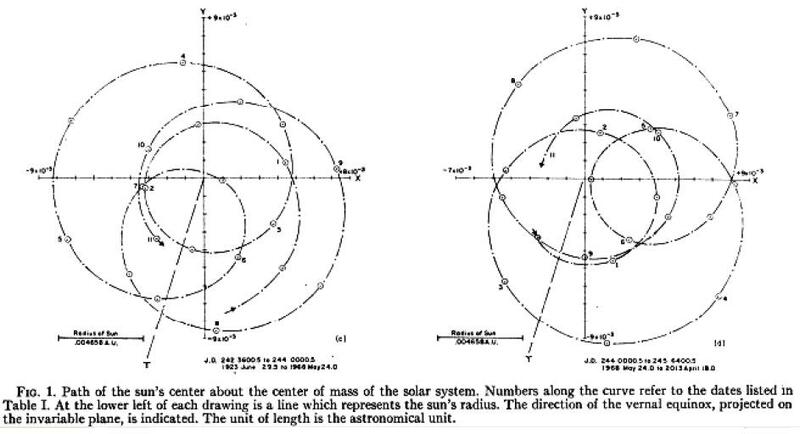 Paul D. Jose in his 1965 paper showed a coincidence between the changes in the sun’s angular momentum as it jiggled around the solar sytem’s center of mass, and the number of sunspots appearing on it’s surface. So what’s the problem? Why is this a controversial area of research? If the planets affect the sun, and the sun affects Earth’s climate, discovering how it works might alter the way we view climate change. Small changes in the Earth’s motion coincide with changes in climate, and Paul Vaughan has been discovering some very good correlations between these climate factors and changes in Earth’s motion caused by the other planets and the sun. Petr ‘semi’ Semerad has discovered that changes in Venus and Earth’s angular momentum coincide with the ~11 year sunspot cycles. Geoff Sharp has discovered the big outer planets move in a rhythm coinciding with drops in solar activity every ~178 years, the size of which depend on the phase of the sunspot cycle when the sudden changes in angular momentum of the sun occur. 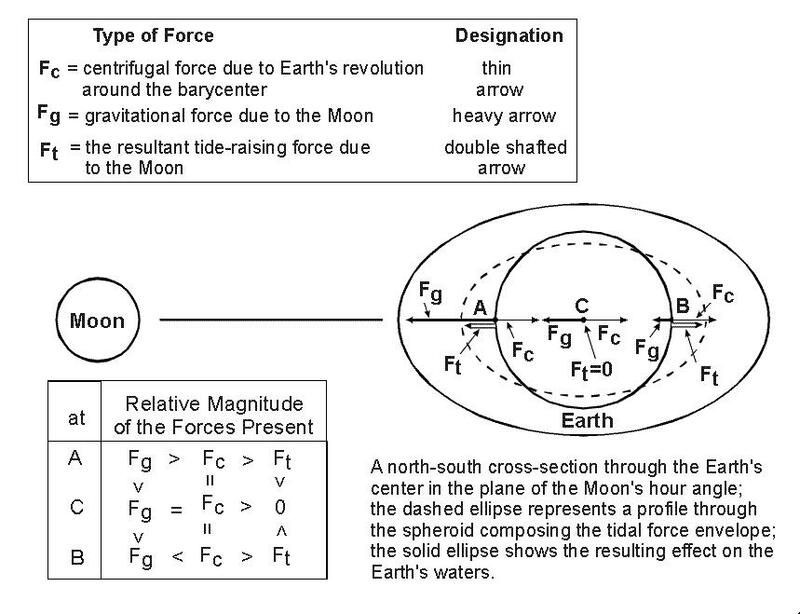 Tidal forces, similar to the tidal effects of the Moon on the Earth. Gravitational effects on the angular momentum of different parts of the sun as it revolves in it’s peculiar orbit around the centre of mass or ‘Barycenter’ of the solar system (SSB for short). Electromagnetic effects due to interactions between the solar and interplanetary magnetic fields and the magnetospheres of several of the planets. Some physicists dismiss these possibilities because they believe the forces involved would be too small to have any effect on the sun. Proponents of the solar- planetary theory disagree, and believe that the possibilities must be quantified, predictions made and tests performed before the hypothesis can be falsified. What form could these tests take? Who’s going to fund a program of investigation? Answers on a postcard, or just add your thoughts or questions below. The ancient Greeks speculated about their Kosmos in terms recognisable as scientific today. Pre-Socratic thinker Thales believed water was the fundamental substance from which all else proceeded. Demokritus first proposed all matter was constucted of irreducably small particles called atoms. Today we know that the simplest expression of matter, the Hydrogen atom, is readily oxidised to form water, releasing a large dose of energy in the process. Hydrogen permeates the universe, in it’s preferred state as a hydrogen molecule, it is invisible to our telescopes and our other means of spectral detection. Other Greek thinkers considered the motion of the heavenly bodies, planets, stars, comets and our Sun. The first to propose that the Earth moved round the Sun rather than believing in an Earth centred Kosmos was Aristarchus of Samos. 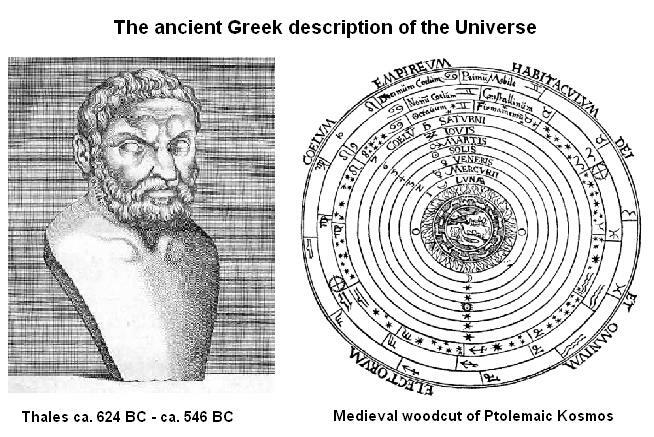 Using geometrical mathematics, he calculated the relative sizes of the Sun and Moon, and reasoned that because the Sun was the biggest body in the Kosmos, and the only self luminous body, it must be at the centre of the part of the Greek Kosmos we now call the solar system. But science makes many twists and turns on the path to knowledge, and the needs of navigators and astronomers for a quantifiable and predictive calculation system led to the adoption of the Earth centred system of Ptolemy, with it’s unphysical epicycles grafted into the theory to explain the apparent retrograde motion of planets at various times. This view was to dominate late classical and medieval thought for 1300 years due to the suppression of other ideas by the gatekeepers of knowledge. A theme we will be forced to return to later. Eventually, Nikolaus Copernicus restored the Sun to it’s rightful place and his work was championed by Galileo Galilei, despite being placed under house arrest and having his telescope confiscated for a time by the guardians of orthodoxy. Galileo also methodically counted sunspots and we still use his observations as part of the sunspot record. Building on the work of Copernicus, Galileo, and Tycho Brahe, German born Johannes Kepler discovered that the proportions of the orbital distances and the rates of motion of the planets conformed to simple geometrical laws which revealed a harmony and resonance in the solar system as a whole. Subsequently, Isaac Newton quantified the concept of gravity, and derived laws of motion describing relationships between mass, momentum and velocity which we still use today. Newton showed that the sun is engaged in continual motion around the centre of mass of the solar system (i.e. the barycentre or SSB) as a result of the gravitational force exerted by the planets, especially Jupiter and Saturn. He came to this conclusion analytically (not by observation) by working through the consequences of his law of gravitation. His cosmological theory of an isometric universe was superceded by Einstein‘s theory of General Relativity with its application to the concept of curved space-time. 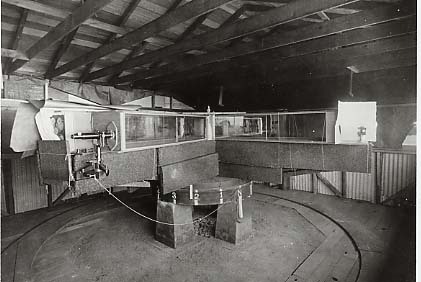 The field of Solar Physics developed throughout the period, but the sun’s remoteness, and it’s enigmatic variation in activity made hypotheses of it’s nature difficult to validate until the recent development of sophisticated equipment and techniques to measure it’s magnetic field, surface activity and periodic parameters. The currently dominant Babcock-Leighton Dynamo theory of the way the sun generates it’s cyclic activity has seen little competition, despite its difficulties and lacunae. In April 1965 Paul D. José, a scientist at the office of Aerospace Research at Holloway Air Force base in New Mexico published a short paper in The Astronomical Journal (vol.70 No.3) entitled: Sun’s motion and sunspots. The importance of the diagram and the rest of José’s paper will form the first part of the next installment. A lot of people are puzzled by the current El Niño. Global average Sea Surface Temperature (SST) has been high, but we don’t seem to have the balmy winters of ten years ago. My simple model explains why. 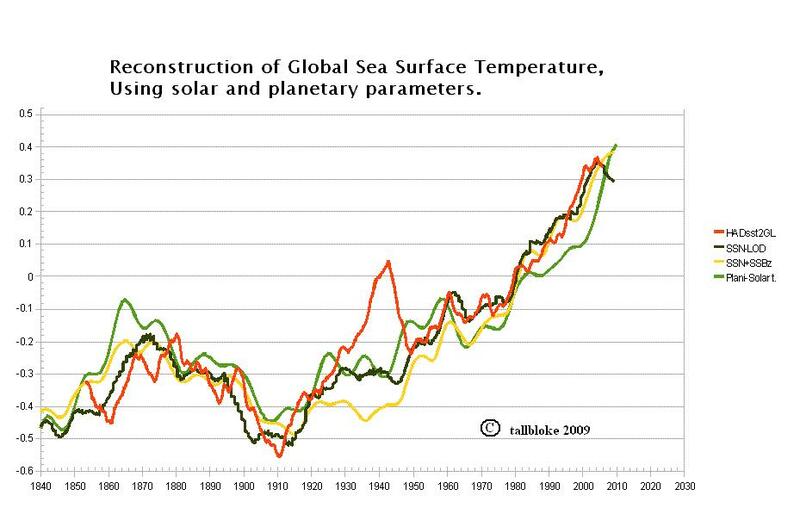 The graph compares sea surface temperature HADsst2GL (red curve), with curves generated from solar and planetary data. The black curve uses a combination of Length of Day (LOD) data and sunspot number data. The monthly sunspot number values are added cumulatively as positive or negative values departing from my estimated ocean equilibrium value of ~40SSN. The LOD values are added via a simple best fit scaling technique using a hghly sensitive piece of equipment called tallbloke’s eyeball. The yellow curve uses the sunspot numbers again, but instead of LOD data, I use the fact that LOD variation approximately correlates with variation in the distance of the solar system centre of mass in the ‘z’-axis from the solar equatorial plane (SSB-z) and substitute in those values instead as a scaled LOD proxy. The green curve goes the whole hog. Since the SSB-z data can also be used as a proxy for sunspot numbers (on a different smoothing and lag value to the LOD proxy), it is used both for sunspot proxy and LOD proxy. This enables me to reconstruct past and predict future planetary surface temperatures, to a limited degree of accuracy. There are a couple of obvious problems. The method does not capture individual El Niño events well. Nor does it predict individual big volcanos, although the volcanic explosivity index does correlate well with the motion of the planets, as I will show in a future post. One further problem is that the technique does not capture the collapse in solar activity which seems to occur when Uranus and Neptune are in conjunction, as at 1800-1840 during the Dalton Minimum, and during the Maunder minimum in the 1630’s . Whether we will see a similar deep solar minimum now following the conjunction of these two planets in 1993 remains to be seen. The large departure of my reconstruction from the SST data around the WWII years is I believe due to well known issues with the switchover from bucket and thermometer measurements to ship engine cooling intake sensors on military vessels. So, the basic premise of my model, is that a cumulative count of sunspots above and below the ocean equilibrium value I have determined will mimic the retention and release of energy from the ocean. At the same time, multi-decadal changes in Earth’s length of day which also correlate with the timings and sign of the major oceanic periodicities (PDO, AMO) add detail to the picture. The high SSN of the late C20th means according to my model, that a lot of heat got absorbed into the ocean. Now the sunspot numbers are falling, that heat is being released again by El Niño’s and the temperature is dropping because that heat is escaping to space and not being replaced by solar energy into the oceans at the rate it was in the ’80’s and ’90’s. I have done calcs on this to support my theory and I will present them soon. Oliver Manuel is a distinguished atomic physicist with a lifelong history of work on the chemistry of cosmogenic isotopes. This thread has been set up for Oliver to discuss his ideas about the origin of the solar system, and the empirical observations which support his hypothesis. In a nutshell, Oliver’s research into the mass fractionation of elements and isotopes has led him to the conclusion that the solar system was formed from the remnants of a supernova. The sun is accreted around a dense neutron core, and the ejected material from the explosion formed the planets. The heavier elements forming the nearby rocky iron cored inner planets, and the lighter elements forming the Jovian gas giants. 1. The only star close enough for detailed study formed on the core of a precursor star that gave birth to the solar system [1,2]. In 1983 Nature even acknowledged the demise (death, end) of established dogmas on the formation of the Solar System . 2. Astronomers assure us that the Sun is a very ordinary star. 3. When stars explode, a neutron star and lots of iron are commonly seen, not Hydrogen like the stellar surface. a.) There is a neutron star at the core of the Sun. b.) There is probably a neutron star at the core of each star. c.) With greater certainty a neutron star is expected at the core of any star that is orbited by rocky, iron-rich planets. Why Dr Ferenc Miskolczi and Dr Miklos Zagoni have been put under pressure to be silent about Miskolczi`s research concerning the atmosphere and the greenhouse effect. In 2004 Dr Ferenc Miskolczi published a paper ’The greenhouse effect and the spectral decomposition of the clear-sky terrestrial radiation’, in the Quarterly Journal of the Hungarian Meteorological Service (Vol. 108, No. 4, October–December 2004, pp. 209–251.). The co-author of the article was his boss at NASA (Martin Mlynczak). Mlynczak put his name to the paper but did no work on it. He thought that it was an important paper, but only in a technical way. When Miskolczi later informed the group at NASA there that he had more important results, they finally understood the whole story, and tried to withhold Miskolczi’s further material from publication. His boss for example, sat at Ferenc’s computer, logged in with Ferenc`s password, and canceled a recently submitted paper from a high-reputation journal as if Ferenc had withdrawn it himself. That was the reason that Ferenc finally resigned from his ($US 90.000 /year) job. I want to make it clear: NASA never falsified or even tried to falsify Ferenc`s results, on the contrary, they fully understand it. They know that it is correct and see how important it is. To make sense of their actions, they probably see a national security issue in it. Perhaps they think that AGW is the only way to stop, or to slow, the coal-based growth of China. In my circumstance where I have been dismissed from my Government paid position in Hungary, I think the information vacuum (in Hungary), has the same type of origin. I believe someone is in the background trying to convince the establishment (media, science, politics) that Miskolczi’s results are against our national security interests. First, they tried to frighten me, and then when that did not work, they kicked me out from my job. So now I am turning to the wider internet to publicise Miskolczi`s work, as I know that his results are valid and true. There is no way and no need to hold them back for the world to understand them. Tomorrow, for the first time in my life, I am jobless. I hope everyone joins me in wishing Ferenc and Miklos well for the future. It uses the fact that changes in Earth’s length of day seem to precede changes in solar magnetism and sunspot production by several years. The yellow curve was generated by combining Sunspot data with LOD data to create a prediction for Ap out to 2015. The recent burst of sunspot activity has arrived on cue. What caused the collapse in solar activity at the start of the 1800’s known as the Dalton minimum? Could it be the conjunction of Uranus and Neptune which seems to accompany each of the grand minima? Does that mean we are due another one now? I’ll investigate that in another post soon. Why does the average sunspot number fall when the average mass of the planets is heading south? Speculatively, could it be that the ‘lensing’ of an electro-magnetic effect emanating from the galactic centre diminishes when the planets are ‘on the wrong side of the sun’? Answers on a postcard, or post your thoughts below. Our friend Vukevic called by and gave me a pointer to a links page at his site which provides a resource for those interested in studying planetary, solar and magnetic phenomena. Hopefully, Vuk will call back to give us some further info on his research.